What to do about the medical use of marijuana (cannabis) as a potential treatment for a number of neurologic conditions, including epilepsy, is a hotly debated issue. There are legal issues surrounding access to cannabis, as well as a lack of scientific research on the usefulness and safety of marijuana as a treatment for seizures. Additionally, many different substances containing cannabis are being used which makes it difficult to study. Evidence from laboratory studies, anecdotal reports, and small clinical studies from a number of years ago suggests that cannabidiol, a non-psychoactive compound of cannabis, could potentially be helpful in controlling seizures. However, there are conflicting reports in the literature. So far, scientifically controlled studies have not shown definitive proof of the effectiveness and safety of marijuana or cannabis in epilepsy. 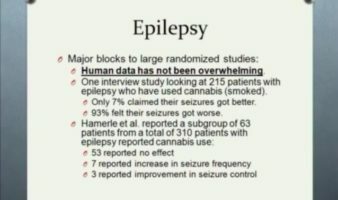 For example, in 2012, a literature review of clinical studies on cannabinoids for epilepsy could not give a reliable conclusion about the effectiveness of four randomized controlled trials of cannabidiol. Yet in the 48 people included in these reports, no side effects were noted. Conducting studies can be difficult as researchers have limited access to marijuana due to federal regulations and even more limited access to cannabidiol; there are also increased financial and time constraints. Individual reports of children with refractory (or intractable) epilepsy who have tried cannabis, usually with high ratios of cannabidiol to THC, have reported marked improvements in seizure frequency, including a report describing the results of Charlotte, a girl with Dravet syndrome. Cannabidiol (CBD): Recently, there have been some open-labeled studies in the U.S. of Epidiolex (a drug derived from cannabidiol or CBD), which is produced by a pharmaceutical company (GW Pharmaceuticals). Epidiolex is a purified, 99% oil-based extract of CBD that is produced to give known and consistent amounts in each dose. The U.S. Food and Drug Administration (FDA) has given some epilepsy centers permission to use this drug as "compassionate use" for a limited number of people at each center. Such studies are ongoing for difficult epilepsies such as Lennox-Gastaut syndrome (in children and adults) and Dravet syndrome in children. Results from 213 people who received Epidiolex (99% CBD) in an open label study (without a placebo control) were presented at the American Academy of Neurology, April 22, 2015 in Washington DC. Data from 137 people who completed 12 weeks or more on the drug were used to look at how helpful or effective the drug was. People who received the Epidiolex ranged from 2 to 26 years old with an average age of 11. All had epilepsy that did not respond to currently available treatments - 25 or 18% had Dravet Syndrome (DS) and 22 or 16% had Lennox-Gastaut Syndrome (LGS). Seizures decreased by an average of 54% in 137 people who completed 12 weeks on Epidiolex. Patients who had DS responded more positively with a 63% decrease in seizures over 3 months. This improvement in seizures lasted through 24 weeks on the Epidiolex, more often for people with DS than without DS. In 27 patients with atonic seizures (which are commonly seen in people with LGS as well as other types of epilepsy), the atonic seizures decreased by 66.7% on average. The responder rate (the number of people whose seizures decreased by at least 50%) was also slightly better in patients with DS (about 55% at 3 months) as compared to patients without DS (50%). People who were also taking the anti-seizure medication Clobazam (Onfi) seemed to respond more favorably to the Epidiolex with a greater improvement in convulsive seizures than in patients who were not taking Clobazam. The authors suggested that an interaction between Clobazam and Epidiolex may play a part in the differences seen. 14 people withdrew from the study because the drug was not effective for them. A controlled study on on Epidiolex involving many epilepsy centers is now being done that will compare children with Dravet syndrome or Lennox-Gastaut syndrome taking the active drug with children not receiving the drug.